Gout is a form of arthritis which occurs when there is a build up of uric acid in the blood, tissues and urine. Uric acid is the end product of the body's metabolism of purine. 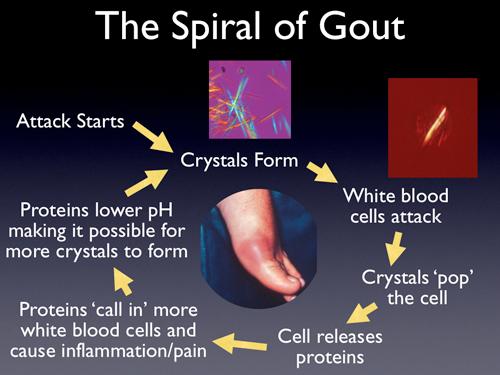 People with gout cannot metabolize uric acid and it builds up in the body and crystalizes. Those crystals get stuck in the small joints and cause pain and swelling. An acute gout attack causes a joint to become painful, hot and very tender to the touch. The most common joint affected is the big toe, but gout can affect the foot, ankle, knee hands, wrists and fingers as well. Repeated gout attacks can eventually damage the joint. Other medical issues can mimic gout. Rheumatoid arthritis, joint infection and pseudo-gout present the same way as gout. Pseudo gout is the development of calcium crystals rather than uric acid crystals in the joint. The only way to know for sure if you have gout is to insert a needle into the joint to draw out some fluid. Uric acid crystal are seen when the fluid is sent to the lab. Bloodwork can also be drawn to check your uric acid level and you blood counts to ensure there is no infection. Gout is treated acutely with colchicine, indomethacin or prednisone. Allopurinol is used to prevent gout in those with frequent attacks. Gout is most commonly seen in men between the ages of 40 and 50. It can be inherited and is associated with a diet in rich foods and obesity. Crash dieting, alcohol consumption, dehydration, certain medications, stress and injury to the joint can also predispose someone to gout. Juice together and enjoy! If you don't have a juicer, you can make this into a smoothie, just add a liquid until it reaches the desired consistency. .So what can you do? 1.. Increase your fluid intake to dilute your urine; eat fresh fruits and vegetables and small amounts of proteins like wild caught salmon, or chicken; increase your intake of Omega 3s using coconut oil, avocados and nuts. 2. Limit vegetables high in purine like cauliflower, asparagus, spinach, green peas, mushrooms. 3. Avoid beer, red wine, soy milk, organ and red meats, sardines, anchovies, shellfish, tuna, high fructose corn syrup, lentils and kidney beans. 4. Apple cider vineger, tart cherry juice, pineapple, ginger and celery have all shown to reduce uric acid. 5. Consuming fish oil and flax seed oil or drinking a tea made from stinging nettle may also help alleviate gout symptoms.